Michael Stroka is a licensed attorney, businessman, Certified Nutrition Specialist, and Executive Director of the non-profit Board for Certification of Nutrition Specialists. Michael successfully embarked on a healing journey through nutrition and has since dedicated his work to championing nutrition as the core of health. Michael is a graduate of Georgetown University, the University of Virginia Law School and Business School, and holds an MS in Human Nutrition from the University of Bridgeport. Question: What was your first experience with integrative medicine, your integrative story? Michael: I was a lawyer and a businessman when serious health issues rendered me unable to continue working. I didn’t find the answers or care I needed in conventional healthcare, so I began my own search and eventually found nutritional therapy. Before then, I had never thought deeply about my health, or about nutrition. I used nutrition and supplements to transform my health and regain my life. I was extremely ill, and now I live a vibrant life. In that process, I was blown away by the power of nutrition. Once I found the answers, I was struck with powerful questions: “Why did I have to look so hard to discover nutritional therapy? Why is nutrition on the periphery -- rather than at the core -- of healthcare? How did you go from integrative patient to practitioner? I started telling everyone my story because I was so excited about how nutrition gave me my life back. It became clear that this is what I was called to do with the rest my life. So I went back to school and earned a master’s degree in human nutrition. How did your career in advocacy begin? I got involved with several nutrition organizations and institutions and I began to see the tremendous potential for these groups to have broader impact on the entire healthcare system. Beyond your personal story, why are you so passionate about nutrition? Science is showing unequivocally that nutrition is at the core of health; it’s the single most important determinant of our well-being. Yet it remains on the fringes of healthcare. Why? Because the infrastructure for respected and recognized nutritionists wasn’t in place. That’s our mission: move nutrition back to where it belongs: at the core of health. Hippocrates himself said, “Let food be thy medicine and medicine be thy food." Nutrition was at the core of modern medicine when it began. Now we have the most advanced acute care system in the world, but we’re awful at dealing with chronic issues. That’s not health care. That’s disease care. An optimal health care system would spend most of its energy preventing diseases rather than treating them. How are you correcting this relegation of nutrition to the fringes of medicine? Our Board confers the Certified Nutrition Specialist® credential, which is the gold standard for advanced nutrition professionals. Our principal work is establishing and maintaining the highest standards for certifying practitioners, including education, curriculum, supervised practice, our board examination, and continuing education. We also have an advocacy arm, Center for Nutrition Advocacy, as there is a great deal of work that needs to be done to achieve structural changes. For example, ensuring that licensing laws for nutrition counseling in every state allow all nutrition professionals to practice to the level of their training. In your opinion, what’s going to change the tide in the public perception of nutrition’s role in healthcare? When most people hear “nutrition,” they think fruits and veggies. “If I eat right, I’ll feel a little better and maybe I’ll be able to prevent a few diseases.” Nutrition is much more powerful than that. It’s not just a preventative tool. It can reverse disease states as well. 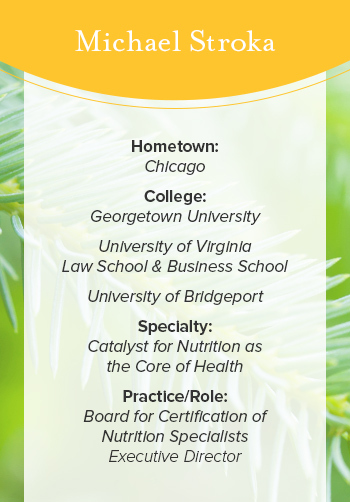 Many of our Certified Nutrition Specialists are not solely nutrition practitioners. As just one example, many are primary care physicians who through our certification now have nutrition as another tool in their tool kits. This is really important because many people don’t know where to go or who to trust. The vast majority of practicing medical professionals have gotten very little nutrition training in their health profession curriculum. I see nutrition now where exercise was back in early 80s. It was just becoming a thing. Very few people exercised then, and if you saw a jogger, you thought of them as a health nut. Now everybody understands that exercise is fundamental to health. People spend lots of time and money on personal trainers and optimizing their exercise regimen. That’s what is going to happen with nutrition. It’s already happening. Also, our notion of “nutrition” will dramatically change as we learn more and more about the powerful way our diets impact our health. As personalized medicine rapidly becomes the norm, nutrition will evolve into the first line therapy of choice for most people, because nutrition is the most personalized intervention of all.